A total of 15 youngsters came down to participate in the second Youth Ranking of the season which took place on Wednesday 13th December 2017. All players have one thing in mind when it comes to these ranking events and that is to win as many games possible in order to gain points to climb up the rankings and get into those crucial top 4 places. The top 4 players at the end of the season are the ones who earn a spot in the Youth European Cup squad. In the First Ranking event of the season we had some great games and some shock results and more of that was expected in this event. In the first round we saw comfortable 3-0 victories for Sean Negrette over Dylan De Los Santos, Ethan Smith against youngster Kyle Mor, Jerome Chipol against the youngest player in the academy Nico Bado, Joseph Ward against newcomer Kadrian Martinez and Justin Hewitt against Elton Victory. Other results from the first round saw Kaylan Franco defeat Jayc Alecio 3-1 and Joseph Borge defeated Liam Santos 3-2 in what was a very tight game. In the first Quarter-Final game Craig Galliano the number one seed came up against one of the academies youngest players Joseph Borge. Craig’s scoring proved to be too much for Joseph as he won the game in straight legs 3-0, but despite the scoreline it was a great performance once again by Joseph. In the second Quarter-Final game Sean Negrette faced Ethan Smith in the battle of the team mates. They both performed consistently with high scoring throughout the entire game. Both players won the first two legs on throw but in the third leg Sean hit a crucial 180 and this gave him an advantage to win the leg and lead the game 2-1. Despite a 180 from Ethan in the fourth leg, Sean still managed to win this leg and ended up winning the game 3-1. In the third Quarter-Final game Jerome Chipol the number two seed came up against Kaylan Franco. In the first ranking of the season Kaylan managed to defeat Jerome 3-0 in what was the big shock result on that day. However, this game was different as it went all the way to a last leg decider, both players had match darts to win but this time it was Jerome who managed to get his revenge back as he hit a crucial double 10 with his last dart to seal the tie and won the game 3-2. In the fourth Quarter-Final game Justin Hewitt the number three seed came up against his good friend Joseph Ward. Joseph has been showing signs of improvement in the last few months but in this game Justin’s power scoring was to much for him to handle as he won the game in straight legs 3-0. In the first Semi-Final game Craig Galliano came up against Sean Negrette. The number one seed Craig was favourite to win this tie but Sean came into this game in great form as he had previously defeated the number four seed Ethan Smith. The game started off with heavy scoring from both players and Sean managed to take the number one seed to a last leg decider. In the last and final leg Sean had match darts to defeat Craig but he did not take the massive opportunity, Craig punished him with his next throw as he hit the double first time to secure the win 3-2. In the Second Semi-Final Jerome Chipol came up against Justin Hewitt. This game promised to be a great one as both players were on fine form throughout the night, however Justin’s scoring and quick double hitting was too much for Jerome as he won the game in straight legs 3-0. The final was contested between the number one seed Craig Galliano and the number three seed Justin Hewitt. This was a repeat of the final contested in the first ranking event of the season which Craig won 4-3. Both these players have definitely proved that they are the ones to beat this season as they continue to produce excellent results. 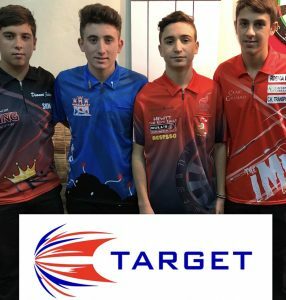 Craig who just recently become the youngest ever player to win a Senior Ranking event came into this event on a high and was determined to win back to back youth ranking events. However, Justin had other ideas as he wanted to give it his all and get revenge back on Craig. The final as expected started with both players battering the treble 20. Craig managed to get into a quick 2-0 lead but Justin was quick to respond and won the next leg to bring the game back to within one leg 2-1. In the fourth leg Justin had a chance to get the game level but he blew his chance and Craig managed to scrape the leg and get the two leg advantage back and lead 3-1. The next leg was vital for Justin as he was only one leg away from defeat, he managed to keep his cool and won the leg to get the game back within one 3-2. The following leg was the last of the game as Craig managed to bring out some heavy scoring and won the leg with a crucial double 10 to take his second Youth Ranking title of the season. 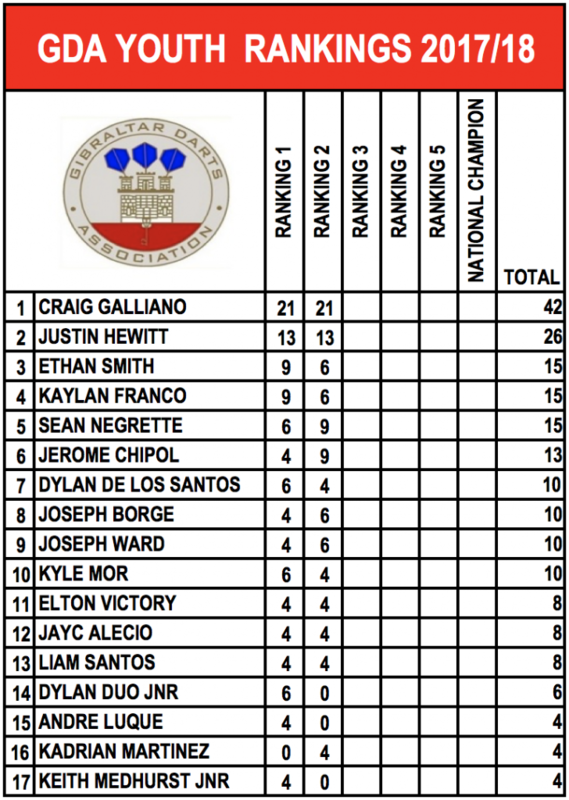 Congratulations once again to Craig Galliano, Commiserations to Justin Hewitt!